As I mentioned to y’all a few weeks ago our family will be moving this Spring…with less than two months to go I’m in full-blown planning mode! While I’m excited to explore a new area (we’ll be near Washington DC) and decorate a new rental home, I’m definitely going to be sad to leave our “dream home” we built two years ago and leave our friends we’ve made during our last four years here in North Carolina. While it may seem somewhat trivial, I’m also sad that my spring gardening is going to be somewhat limited by moving in mid-May! I’m no natural green thumb but I’ve been desperately working on it over the past ten years! I’ve always loved container gardening, and last year I branched out and built an easy and cheap raised garden bed and loved it so much I plan to replicate that at the new house as soon as we arrive. Until then I’ll be limited to gardening in containers I can take with me on the move. In the spirit of planning I’ve decided to list my favorite container gardening tips today!! There are so many containers to choose from, from concrete to plastic. I usually choose plastic for it’s light weight and inexpensive cost. I also have a lot of terracotta pots which are also fairly inexpensive but I’ve found that terracotta pots dry out much faster than others so if you are like me and struggle to remember to water your plants that may not be the best option (unless you choose plants that thrive in dryer soil as we’ll discuss later!) I rare choose heavier planters as I like to rearrange my plants on my porch a lot so if you do choose larger planter consider getting a rolling platform to set it on for ease of movement. Another consideration when choosing a planter is proper drainage. This will make or break your plants so I don’t recommend choosing a planter with less than a 1/2 inch opening in the bottom. If you choose plastic and the hole isn’t big enough you can easily drill extras. If your planter does not have enough drainage your plant roots will stay too wet and can rot and kill your plant. I personally have not gotten to the point of gardening organically myself. I need all the help I can get so I usually use Miracle-Gro potting soil with built in fertilizers. I also regularly add Miracle Gro plant food to my plants using the hose feeder system. This is what works for me. Like I talked about yesterday, I’m taking baby steps to more healthy options so I’m sure I’ll look into organics more in the future but for now I feel comfortable with the research I’ve done. My friend Amy (who was just voted Best Gardening Blog over on Better Homes and Gardens!) has tons of much more in-depth and natural gardening resources here if you’d like to learn more about those options. No matter what kind of soil you choose be sure you’re giving your plants enough of the nutrients they need to grow or all your hard work will end up being a waste. 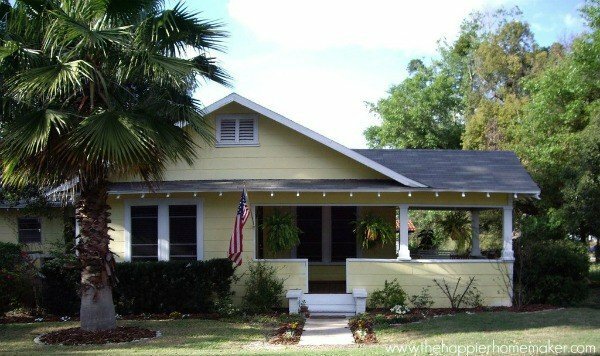 When my husband and I were first married we bought a cute little 1940s bungalow down in Florida. Eager to try my hand at gardening for the first time I added some ferns and spider plants to my porch and lined our front walkway with pretty red flowers. It looked gorgeous until a week later when all of those pretty red flowers had died due to the fact that they were shade plants I planted in a full sun area! That, my friends, was my first lesson in reading the tags on plants! Whenever I’m planning a container I first look at where the container will be placed and observe the amount of sun that area gets on a normal day. I know that in our current home plants on my front porch get lots of morning sun but little to none in the afternoon so partial to full sun plants do well there. On my back porch there isn’t much direct sun until the late evening so shade plants flourish there. I’m willing to bet this is the #1 mistake newbie gardeners make-always get a realistic estimate of your container’s sun needs before choosing plants, and if you do choose the wrong plants for the location the beauty of container gardening is you can always move your container! The general rule of thumb when planning a container planting is to choose three plants-a tall plant, a filler, and a trailing plant that will spill over the edges. I love trailing plants and that gorgeous overflowing look they give! 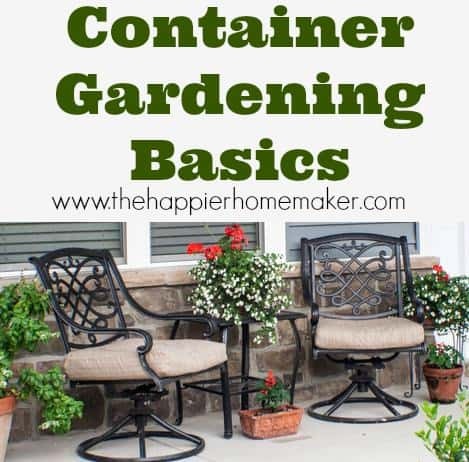 The key to gorgeous containers is to make sure that all of the plants in your container have the same water and sun needs so they all flourish. Plants die. Even the most experienced gardeners lose plants from time to time. If one of your container plants dies don’t get discouraged-you can take it out and put in another if it’s affect the look of your container and either throw the failing plant out or move it to another container if you want to try to nurse it back to health. Keep trying! If an admitted “black thumb” like myself can learn to garden, anyone can! Great tips, Melissa! I tend to have a black thumb, but I’ll never give up! Me neither Gwen, just gotta keep trying and learning right?! Love these tips! Coming over from the link-up at The Bold Abode. Thanks so much for stopping by Ashley! Have a great weekend! Great tips Melissa and thanks for linking up to your garden bed post. We have been planning to do a vegetable bed for the last 2 years but never got around to it. Your post is my push to get it done this Spring! Pinning. Thanks for sharing in the Tatertots and Jello link party. I’m so excited it’s that time of year to start gardening, and these tips are really going to help. I’m doing container gardening for the first time this year! Would you be any to provide any info or links to help with choosing the right plants to pot together?